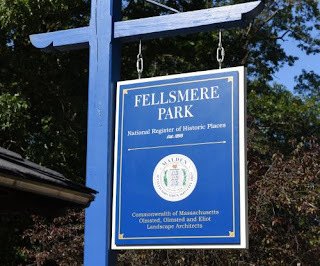 Councillor Debbie DeMaria had beautiful weather for the installation of a new Fellsmere Park sign along the Fellsway East road at Fellsmere Pond. Councillor DeMaria held the ceremony in conjunction with the 197th birthday of one of the benefactors of this beautiful amenity, the first Mayor of Malden, Elisha Converse. Adding tremendous excitement to the event was that Sheryl Mills, Elisha Converse’s great-great-niece attended the event with her husband Jim. 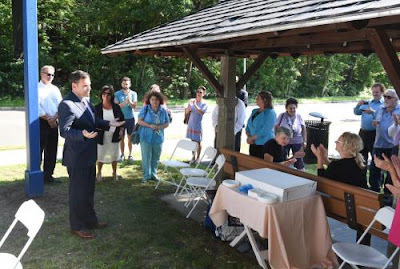 Mayor Gary Christenson, State Representative Steve Ultrino, former Mayor Ed Lucey, City Councillors John Matheson and Ryan O’Malley, local elected and City officials, members of the Historical Society, Historical Commission, Library Trustees and residents participated in the event. The new signage informs visitors and passersby of when the park was established and informs them that this historic location is on the National Register of Historic Places. Councillor DeMaria worked with the Historical Society to design the sign, decided on the best location and also financed the project. She also thought it fitting to acknowledge the birthday of Mayor Elisha Converse whose generosity helped establish the park and who greatly benefitted the City of Malden in many ways. In addition to being the first Mayor of Malden, Elisha Slade Converse (1820-1904) was a businessman, founder and President of the Boston Rubber Shoe Company, a founder of Malden Bank, and later the First National Bank of Malden where he served as President for 30 years. He also served in the Massachusetts Legislature as a State Representative and a State Senator. A generous philanthropist, he was involved in the construction and establishment of the Malden Hospital, Malden City Hall, Malden Public Library, Malden YMCA, Malden Historical Society and the Malden Auditorium – one of the finest theaters in the Boston area. He also donated the property for the creation of Fellsmere Park and the property to create Pine Banks Park. After a horrendous fire in 1875 which nearly destroyed Mr. Converse’s business, the Boston Rubber Shoe Company, he realized he needed to secure an emergency water supply and purchased some property at the site of the current Fellsmere Pond. He had a water pipe installed in the stream-fed swamp that led directly to his business. Years later with the encouragement and assistance of Malden Resident Sylvester Baxter (who later became the first secretary of the Massachusetts Metropolitan Park Commission) he supported the idea to convert the area into a park where residents of future generations could walk, sit and enjoy nature. The Malden Park Commission began working on the initiative and invited famous Father of American Landscape Architecture Frederick Law Olmstead to design the park. Fellsmere Park was established in 1893 due to the generosity of Mayor Converse and the second Mayor of Malden John Sleeper. Mayors Converse and Sleeper donated many acres of their own land which now makes up Fellsmere Park. The Malden Park Commission also bought surrounding parcels to create the 40 acre site.